Director – Christopher Nolan, Screenplay – Christopher Nolan & Jonathan Nolan, Story – David S. Goyer & Christopher Nolan, Based on the Comic-Book Created by Bob Kane, Producers – Christopher Nolan, Charles Roven & Emma Smith, Photography – Wally Pfister, Music – James Newton Howard & Hans Zimmer, Visual Effects Supervisor – Nick Davis, Visual Effects – Buf Compagnie (Supervisors – Pierre Buffin & Dominique Vidal), Cinesite Europe (Supervisor – Ian Hunter), Double Negative (Supervisor – Paul Franklin) & Framestore (Supervisor – Tim Webber), Special Effects Supervisor – Chris Corbould, Production Design – Nathan Crowley. Production Company – Warner Brothers/Legendary Pictures/DC Comics/Syncopy. Batman continues to fight crime in Gotham City. Also on the rise is crusading District Attorney Harvey Dent who has become the city’s leading light for his fearless prosecution of criminals. Batman is in admiration of Dent’s efforts, although there is unresolved tensions between them in that Dent is now dating Bruce Wayne’s ex Rachel Dawes. At the same time, organized crime is approached by a figure known only as The Joker who wears clown makeup and has a scarred face cut in the shape of a smile. The Joker offers to unite the gangs and eliminate their common problem – Batman. The Joker begins a series of killings and insanely clever crimes designed to create anarchy, saying he will only stop when Batman comes forward to unmask himself. The Dark Knight was the second of Christopher Nolan’s Batman films, following his reboot of the cinematic franchise with the highly successful Batman Begins (2005) starring Christian Bale. Here, Nolan has reunited almost all of the personnel that he had both behind and in front of the camera with Batman Begins – the notable exception is Katie Holmes who ascended to Tom Cruise headline fame after Batman Begins came out, which presumably put her asking price up, and has been replaced here by Maggie Gyllenhaal. As with Batman Begins, Christopher Nolan crafts his own distinctive take on the Batman mythos that sits aside from previous versions. In the two other best Batman films – Tim Burton’s Batman (1989) and Batman Returns (1992) – Burton invested the comic-book characters in funny costumes with a driven psychological urgency. Burton, with his preponderance for marvels of production design and costuming, turned his Gotham City into a darkly fantastical world of comic-book noir. Christopher Nolan by contrast darkened the psychological focus but (to some disappointment) created the world around Batman and the villains as a resolutely realist one. (The Dark Knight is oddly the first ever Batman film to not feature the name Batman in its title – perhaps further evidence of Christopher Nolan’s desire to take the series out the comic-book). The focus of Batman Begins was Christopher Nolan and David S. Goyer’s script, which placed all the drive on the evolution of Bruce Wayne into Batman. 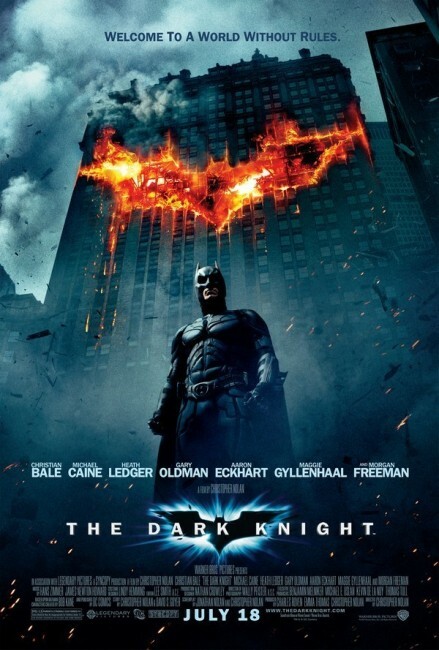 With The Dark Knight, David S. Goyer steps back to only providing the original story while Christopher Nolan and his brother and frequent collaborator Jonathan write the screenplay itself. What emerges on screen is an astounding tour-de-force. You can run the two films alongside – Batman Begins is like an origin story, while The Dark Knight reads as not so much a sequel but a second act that builds out on everything that has been laid down in the first to develop a breathtaking saga. With Christopher Nolan having stripped away much of the overtly fantastical, the story is now like an amazing cross-section of the conflicting forces of crime in a city – one was constantly reminded of something like tv’s The Wire (2002-8) and the way it shows how the different stratas of the city from street criminals, the police force and city hall interact. The Nolans have chosen three essential characters as the focus of the story – Batman, The Joker and Harvey Dent in the process of his transformation into Two-Face – and the story is a beautifully wound saga of the way in which the dynamic that each of these represents comes to mirror and play off one another. The Dark Knight is a film that grasps at huge issues like light and darkness, the public perception of heroes and of asking what the rules of morality that heroes and villains operate by are. The writing is dazzling, making The Dark Knight possibly one of the finest of all comic-book-to-screen screenplays that has graced the screen to date. The downside of Christopher Nolan’s resolutely realist take on the Batman mythos is that he strips away some of the more Gothic touches familiar to the comic-book. Seeing Christian Bale and Michael Caine in a featurelessly blank concrete block basement is no replacement for the Batcave. I also found the armoured Humvee Batmobile one of the uglier aspects of Batman Begins. Nolan at least blows the Humvee Batmobile up this time, so maybe that means a more traditional design in the next film – although here we also get a Batbike, which is designed as two monster wheel tires with a connecting strut. One of the other odder aspects is that we never actually have Batman swinging through the skies of Gotham City by Batrope as he does almost anywhere else – there are a couple of scenes with Christian Bale flying about on what looks like a batwing backpack and one scene where Bale does an improbable fall from several stories down to land on the roof of a car with Maggie Gyllenhaal in his arms and both emerge uninjured – but no Batropes. On the plus side, the one thing that Christopher Nolan does to improve over Batman Begins is to perfect the action scenes, which were one of the weaker aspects of the first film. There is one great sequence in mid-film with The Joker blowing up vehicles with a rocket launcher, Batman zipping about through traffic on the Batbike and winding ropes that causes an entire truck to flip its own length, which ends up completely singing. That said though, The Dark Knight is a film where the focus is on the script and the characters less than it is the action scenes. The cast are all on top form. 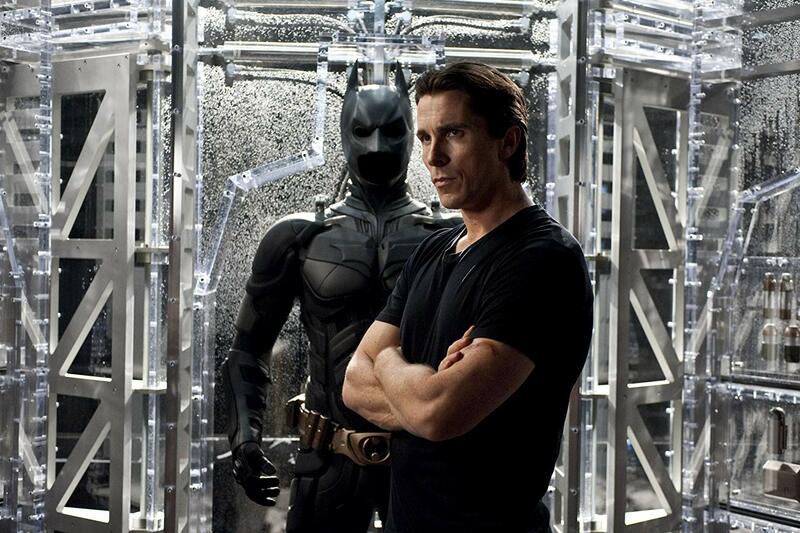 Christian Bale is at full strength, making Bruce Wayne seem even more darkly brooding and morally ambiguous than before. Maggie Gyllenhaal does capably as Rachel – it is not the enormously talented Gyllenhaal’s best work but she is effective in the part, much more so than the blank Katie Holmes. Of course, the performance that almost entirely overshadowed The Dark Knight was Heath Ledger’s Joker. It is a part that was made even darker and more ghoulish after Ledger’s death in January 2008 from an accidental overdose of sleeping pills. Ledger and Christopher Nolan gives us a Joker that is totally different from Jack Nicholson in the Tim Burton Batman (or even from Cesar Romero’s prancing dandy in the Batman (1966-8) tv series and Batman (1966) film spinoff and Mark Hamill’s gleefully maniacal incarnation in the 1992-4 animated tv series – the less said about the Kevin Michael Richardson voiced green dreadlocked The Joker in The Batman (2004-8) the better). Most of these have followed the comic-book in one way or another and given us a character in a natty purple suit with white face, green hair and exaggerated smile. However, in Heath Ledger’s incarnation, The Joker becomes less immaculate – the makeup is pasty and half-rubbed off; the smile is a big red lipstick smear with the suggestion of scars beneath; the green hair is a bedraggled unkempt mess; the purple suit is there but subdued, while Ledger plays with hunched stagger and constant licking of his lips. This is less insanely cackling clown figure than it is scruffy madman with a flair for the diabolic. 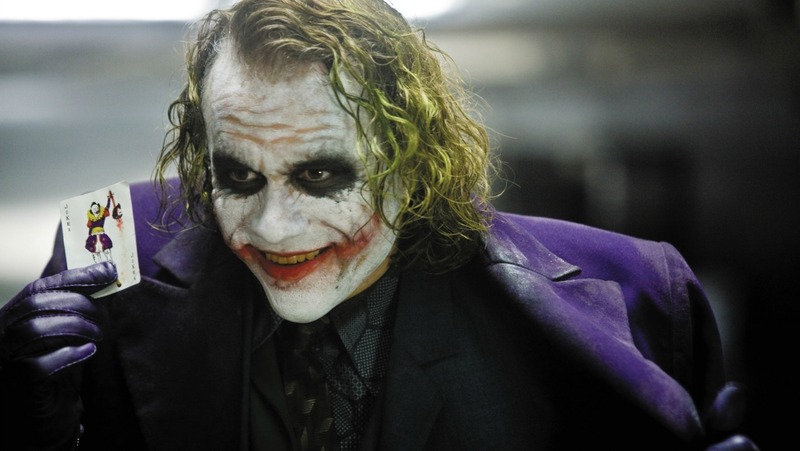 The Nolans’ writing has a considerable brilliance that Heath Ledger takes to with enormous relish and lets the character shine with its own unique madness. The role saw Ledger winning a posthumous Academy Award for Best Supporting Actor. I have never been a huge fan of Aaron Eckhart’s cocky, lantern jawed acting – excepting perhaps the film in which he came to fame In the Company of Men (1997) and the occasional oddity like Thank You for Smoking (2005). That said, Eckhart and the Nolans do great things with Harvey Dent. The portrait of Harvey Dent as crusading district attorney is written with great strength, much more so than has ever been covered in the comic-book – indeed, it is more than four-fifths of the way through the film before Dent gets the distinctive injury that transforms him. Eventually we do get to see Two-Face – although the makeup team’s depiction of the burned side of Eckhart’s face is so extreme that Two-Face comes across more as half-rotted George Romero zombie. (The nitpicker in one kept wondering with one eyeball uncovered and half of Eckhart’s mouth and cheek torn open, how it is that Dent does not end up suffering from major infections as a result of so much exposed and unhealed flesh). 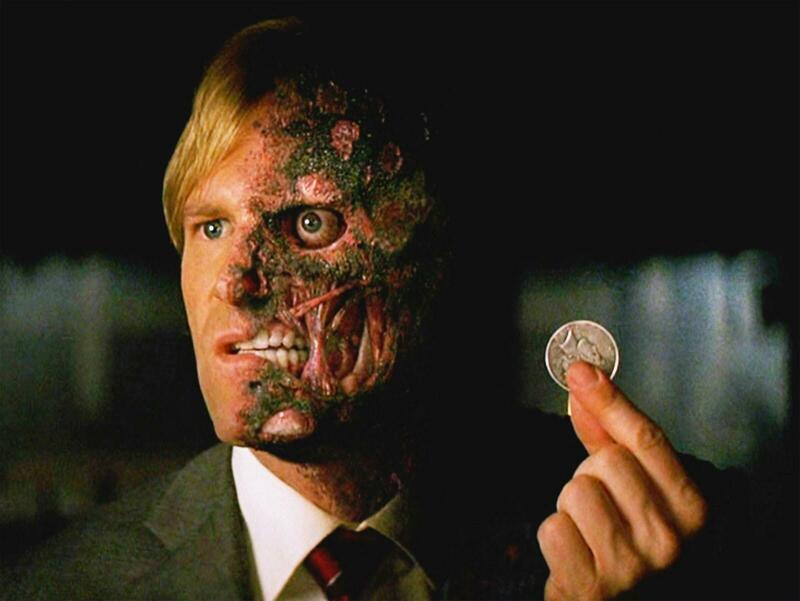 Although he is overshadowed by Heath Ledger, Aaron Eckhart’s performance and the characterization of Two-Face are one of the best things about The Dark Knight. Echkart and the Nolans by and far erase all memory of the grotesquely over-acted Two-Face that we had in Joel Schumacher’s Batman Forever (1995). Ironically, even though Tommy Lee Jones is by far the better actor than Aaron Eckhart, Eckhart easily wins the day hands down. We also get a minor blink-and-you-miss-him return of Cillian Murphy as The Scarecrow again at the very start of the film. Although we do get to see Murphy in traditional Scarecrow burlap-sack mask, neither of Murphy’s appearances here or in Batman Begins give The Scarecrow any substantial or worthy treatment. Christopher Nolan followed this up with a third Batman film The Dark Knight Rises (2012). Also of note is Batman: Gotham Knight (2008), a compilation of anime Batman shorts made as a tie-in for the release of The Dark Knight. Nolan also directed the psycho-thriller Insomnia (2002), The Prestige (2006) about rival Victorian stage magicians, the mind-bending Inception (2010) about dream espionage, the space exploration film Interstellar (2014) and the non-genre War film Dunkirk (2017). He has also produced Man of Steel (2013), Transcendence (2014), Batman V Superman: Dawn of Justice (2016) and Justice League (2017). Also of interest is Batman & Bill (2017), a documentary about the unacknowledged co-creator of Batman, Bill Finger. (Winner in Best Film this site’s Top 10 Films of 2008 list. Winner for Best Director (Christopher Nolan), Best Adapted Screenplay, Best Supporting Actor (Heath Ledger) and Nominee for Best Supporting Actor (Aaron Eckhart) at this site’s Best of 2008 Awards).